A large mangrove forest with much biodiversity is the scene of a dispute between conservationists, small farmers and inland fisherfolks, and the illegal prawn industry. 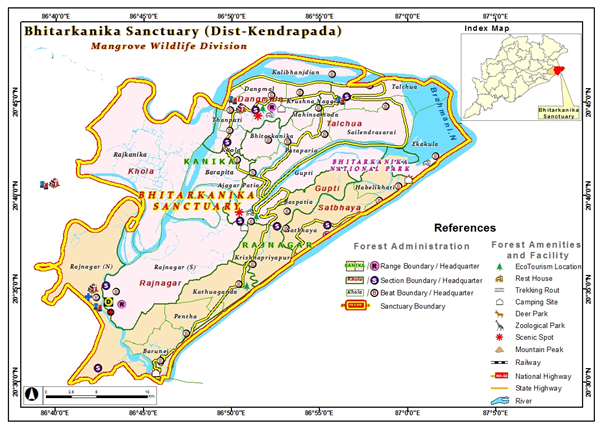 The Bhitarkanika National Park, in the Kendrapara district of Odisha contains India's second largest mangrove forest, after the Sundarbans, covering 672 km2. According to the 2011 census, there were 310 villages with 145,301 people living inside the park, which results in a high population density of 216 persons per km2. It was designated as national park on 16 September 1998 and as a Ramsar site on 19 August 2002 due to a large variety of endemic flora and fauna, including the leopard cat, sambar, salt water crocodile, python, water monitor lizards, marine turtle, brahminy duck, to name a few (1). This high density population of tribal groups dependent on the biodiversity rich forest is a source of triangular dispute between conservationists, small paddy farmers and inland fisherfolks, and the illegal prawn industry. The first major conflict is between the traditional fisherfolks and the forest officials. Each year there is a ban on fishing in a 20 km radius from the coast for a period of seven months (November 1–May 31) coinciding with the breeding period of the Olive Ridley turtles, which is enforced by the forest department to protect these endangered turtles, under the Orissa Marine Fishing Regulation Act, 1982 and Orissa Marine Fishing Rules, 1983; as a result of which, nearly 20,000 traditional fisherfolk in Kendrapara district are affected every year (Banerjee 2017) (2). They are often arrested for alleged trespassing and their nets and boats seized. In 2014, 221 fishermen were arrested and 32 boats and trawlers were confiscated in the region (3) (4). Apart from conflicts on livelihood, there have also been conflicts for land rights. The forest department claims rights on the land and seems interested in evacuating the whole village from the area, which has been partially accomplished. Due to which, one can see the decline in the area of the village from 499 acres in 1971 to 244 acres in 2011. Interviews revealed that many people were evicted in the middle of the night as the forest department torched their houses claiming that the land belongs to the government, which has led to various protests and finally, the villagers were forced to migrate to nearby villages (Banerjee 2017). Another such protest was witnessed in the year 2001. The villagers protested for two days for the construction of a river embankment which was affecting their livelihoods but were beaten by the forest department in the process. The embankment was needed as it would prevent the salt water from the creeks from entering the fields. The forest department was not in favour of the embankment since they were of the opinion that the flow of water would be disturbed. Despite this stand off the embankment was constructed. Till date, the people are protesting for their land rights in the region. Most of them have grievances against the government for not granting them their rights and providing better amenities (Banerjee 2017). Project Details Designated as national park on 16 September 1998 and as a Ramsar site on 19 August 2002 due to a large variety of endemic flora and fauna, including the leopard cat, sambar, salt water crocodile, python, water monitor lizards, marine turtle, brahminy duck. A mangrove forest covering 672 sq.km. The Bhitarkanika Mangroves are home to 55 of India's 58 known mangrove species. The mangroves harbor one of India's largest populations of saltwater crocodiles, and Gahirmatha Beach, which separates the mangroves from the Bay of Bengal, is the world's most important nesting beach for Olive Ridley sea turtles. 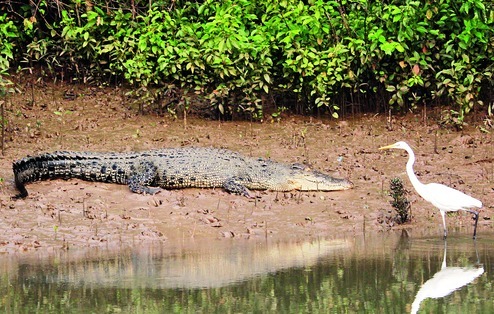 Relevant government actors Bhitarkanika National Park. Ministry of Environments and Forests, MOEF (India). Environmental justice organisations and other supporters Marine Turtle and Mangrove Conservation Society (MTMCS). 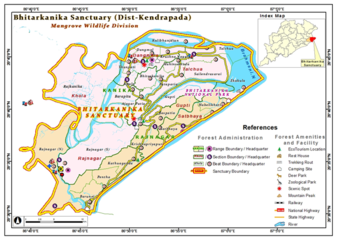 Development of Alternatives There is hope that ecotourism in Bhitarkanika Wildlife Sanctuary (BKWS) may be able to empower the local inhabitants economically, socially as well culturally. (8). Why? Explain briefly. Villagers find themselves placed between regulations and displacements by the park authorities on the one side, and pressure from shrimp farmers destroying mangroves, on the other side. Wildlife (e.g. 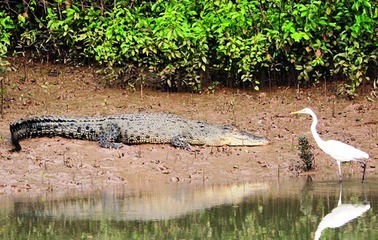 number of crocodiles) has been increasing, so conservationists are pleased. 3. Fishermen arrested for fishing in Bhitarkanika National Park.